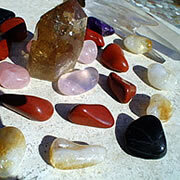 Crystal Healing is a form of healing that uses crystals or gemstones. 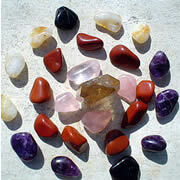 The crystals are mainly placed on specific areas of the body called "chakras" or other part of the body. Chakra is a Hindu term for spiritual energy. Crystals of the same color as the color of the chakras can be placed there to enhance the flow of energy. Crystals are said to direct the flow of energy towards the person in a particular part of the body and bring balance and harmony to a person's energy. In a Shamanic Crystal Healing session is I will use my intuition to scan your energy system. You may lay down in a comfortable place while powerful and sutle crystals are placed on your body and thus used to help eliminate congested and depleted energies. It is a deep and harmonizing healing. Since the earliest times, crystals have been used to heal and to restore balance. They help in releasing and clearing negative energies, thereby assisting in energy healing. Crystals are nature’s gift to man that augment healing. 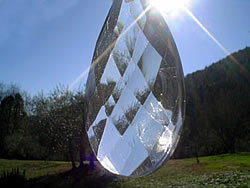 Crystals are found in all shapes, sizes, colours and composition. Each crystal has a unique vibrational resonance. They owe their unique qualities to their mineral content, their inherent geometry and the colour frequency which they emit. The human body has a complex electromagnetic system, also known as vibrational energy system. Nature has created crystals to be perfect electromagnetic conductors, capable of interacting with our electromagnetic system. Crystals have been found to carry vibrations that activate certain energy centers within our electromagnetic system, thus having a positive effect on our entire body system.